The sensory table is a staple in Early Childhood classrooms (or it should be). Each week I reflect on and create a plan for the sensory table. It is a place where students LOVE to play and just like any other space in my classroom, I need to be intentional about how I set it up. I like it to be inviting, engaging, and a place where learning will occur. Make sure you download the FREE sensory table planning printable later in this post. “Play is often talked about as if it was a relief from serious learning. But for children, play is serious learning.” Mr. Rogers. I LOVE this quote and it really speaks to me about how important play is. As teachers, it is our job to set up the environment, ask questions, and take students’ play to the next level! Plan and reflect about what materials you want to put in your table. I change out the sensory table filler and tools every two weeks or so when my theme changes. If you want sensory table ideas for each theme (with real classroom photographs) check out my FREE Curriculum Guide HERE I always connect the material to what we are learning about and what my students are interested in. There are ENDLESS materials you can put in a sensory table! Above are some of my favorites! Below is a giant list of sensory table fillers you can use to fill the sensory table. And when I say fill I mean, cover the bottom or put in the table so students can scop, dig, fill, and play! Every week in my lesson plans I have a learning objective for the sensory table. Adding different tools to the sensory table will support different objectives and learning domains. I get most of my tools from the Dollar store, Target Dollar Spot, Walmart, or Amazon. Here is a giant list of some of my favorite Sensory table tools. Just a note: Don’t put too many tools in the sensory table to make it difficult for kiddos to manipulate, instead change out the tools once a week to keep it exciting, engaging, and to take their play to the next level. As teachers, we always need to know why we are doing an activity and be able to justify it. When you put a sensory table filler in with tools you should know what objective or skills students will be strengthening during play. Different tools target different objectives. For example, if you add tweezers and colored noodles, students will be strengthening their fine motor muscles. By adding small baby food containers students can practice sorting. If you put in small rocks, letter rocks, and diggers students will be exploring letters and size because the rocks are different sizes. I made the letter rocks myself by buy some rocks from the craft section at the dollar store and writing letters on them with paint markers. The small rocks are from the landscaping section at Loews. If you teach Kinder or Pre-k place literacy or math game pieces in the Sensory table. Sometimes for a small group, I take out the sensory tools and put pieces to a matching puzzle in the sensory table. Students have to find the pieces then complete the puzzle. Just a fun way to make printables more hands on! Check out my birthday themed sensory table to practice counting and identifying numbers! It has colored rice, plastic cupcake cups, candles, and number candles. If your students need to practice identifying letters, put in small letter beads and student name cards so students can place their friends names on the cupcakes. The next week we continued out birthday theme and I just changed out the props. To explore measurement and capacity I added measuring spoons, measuring cups, large bowls, and whisks. By purposely adding something new or changing the activity each week, students have something new to explore or expand upon. Making their play fun, exciting, and intentional! Incorporate math, science, dramatic play, fine motor, and literacy intentionally by adding various tools and/or props. Plan activities and materials that infuse other areas so students are always learning. See it in action….. watch the video below! 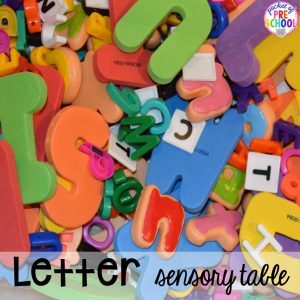 Dump any letter manipulatives you have into the sensory table. My students had the idea to make letter soup so we added bowls, measuring cups, and spoons. Another week I added sorting trays and students sorted the letters in different ways. We had beans in the sensory table during our Food theme last fall. I added tweezers, small plastic bottles, cardboard tubes, and measuring cups. The tweezers were added first to strengthen their fine motor muscles. The bottles and measuring cups were added the following week so students could explore measurement concepts and volume. Legos are always a hit and amazing fine motor work. The first week students were just building to strengthen their fine motor muscles. Then I added STEM I Can Build cards to give students a visual support and to encourage them to engineer and build with a plan and purpose. Ice experiments and investigations were a ton of fun during our winter theme! Students used pipettes, tweezers, and water to investigate their own ideas and conduct their own experiments. One student experimented with how to make holes in the ice. See his little hole with the blue water in it! The next week we were learning about animals that lived in the Arctic. I froze plastic arctic animals in ice. As the students were trying to free the animals, they were talking about the animals and building their vocabulary! For Christmas, I put wrapping paper scraps and ribbon in the Sensory table for students to cut to help develop scissor skills. The second week I added tape and small boxes for students to wrap to continue to strengthen those fine motor muscles. I mean what kiddo doesn’t LOVE to cut things up into tiny pieces. If you are not allowed to do a Christmas theme you can do a birthday or just plain wrapping paper Sensory table for a birthday or color theme! Sand is just so calming in the Sensory table! To start, I only put in buckets, funnels, and shovels. Students had funnel races and they explored the relationship between the size of the funnel and the amount of sand it holds (volume)! The next week, I added two empty juice bottles so students could practice sharing and taking turns. Social skill objectives are important too! If you are learning about planting, create a Sensory table so students can pretend to plant seeds and act out the life cycle of a plant! We pretended the rocks were seeds and I put in various size pots and fake flowers so students could compare and sort by size. In my classroom whatever is in the Sensory table tends to end up on the ground. Add baskets with dustpans and brooms so students can clean up what flies out! Make a square on the floor with tape (we used our square tiles) to give a visual support to show students where to sweep the mess too. At the beginning of the year students needed help using the dustpans but as the year went on they were able to do it independently. We all LOVE sensory tables but let’s face it they can be expensive. The one pictured above was from my full day classroom and it was amazing. When I started my in-home preschool I just didn’t have it in the budget to get a fancy sensory table so my hubby made one for my classroom…..And do you know what? It is just as amazing as the fancy one above! You can find the tutorial HERE. Wondering what’s inside? Well, it’s fishing for letters using fishing poles I made with towel rods, tweezers, magnet wands, and magnet letters (small, wooden, and jumbo size). I hot glued a ribbon to the back of a cookie pan and hung it on a command hook. Students posted the letters they found which lead to lots and lots of conversations about letters and letter sounds. Don’t forget to GRAB the FREE Sensory Table Planning Lists HERE! Need ideas for other centers in your classroom? I’m here to help! Check out ideas on how to set up each classroom center HERE! Want to know my absolute favorite sensory table tools? Check out this post by clicking the photo below! Check out my Pinterest board for more sensory table inspiration!